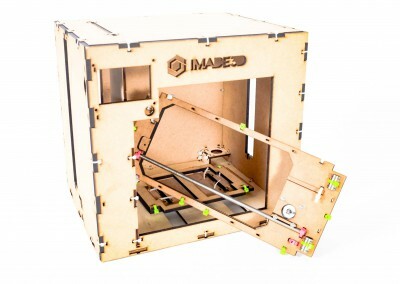 The idea behind IMADE3D was simple: focus on 3D printers foremost as a learning experience. 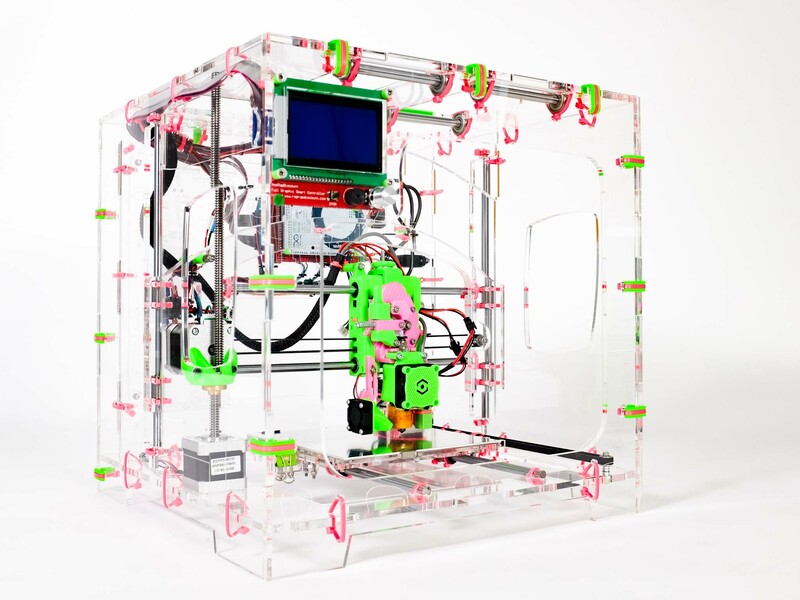 There is no better way to learn 3D printing in depth than to build your own machine! Since the 3D printer kits on market didn’t satisfy our high demands on ease of build, use, and print quality, we created the JellyBox. It’s great for parents with kids, teachers, students, teenager, boys and girls. 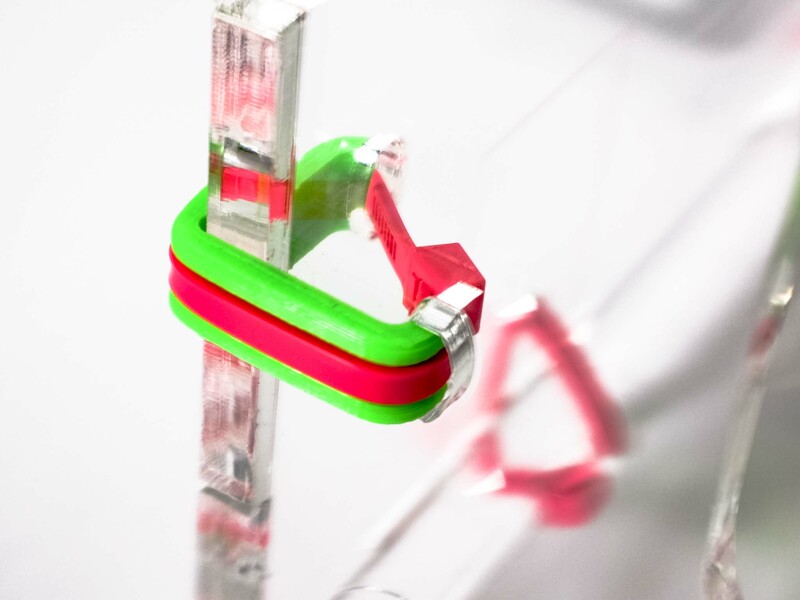 Colorful zip ties make the JellyBox fast and easy to build (and ever faster to break down). Plus, any mistake is easy to undo! Just snip and pull. Now you can make all the mistakes you want – it’s good for learning. 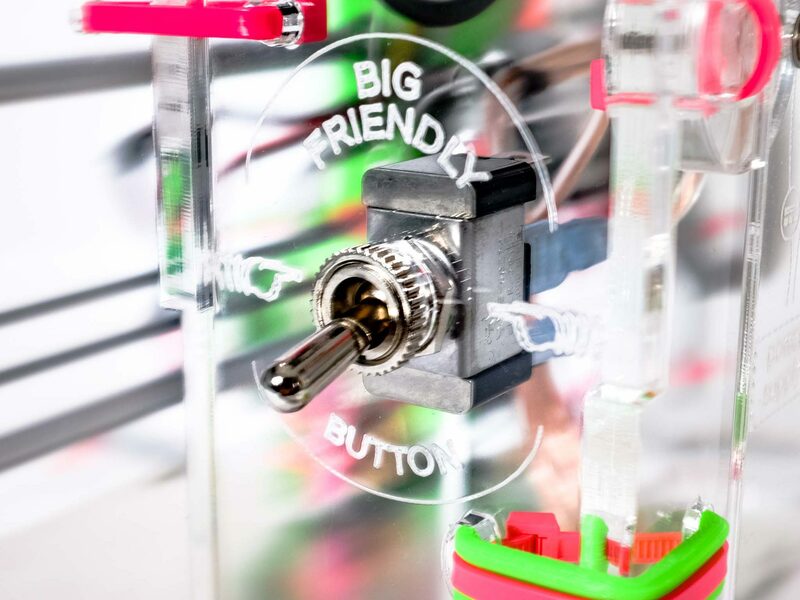 Also, there is a BIG FRIENDLY BUTTON. 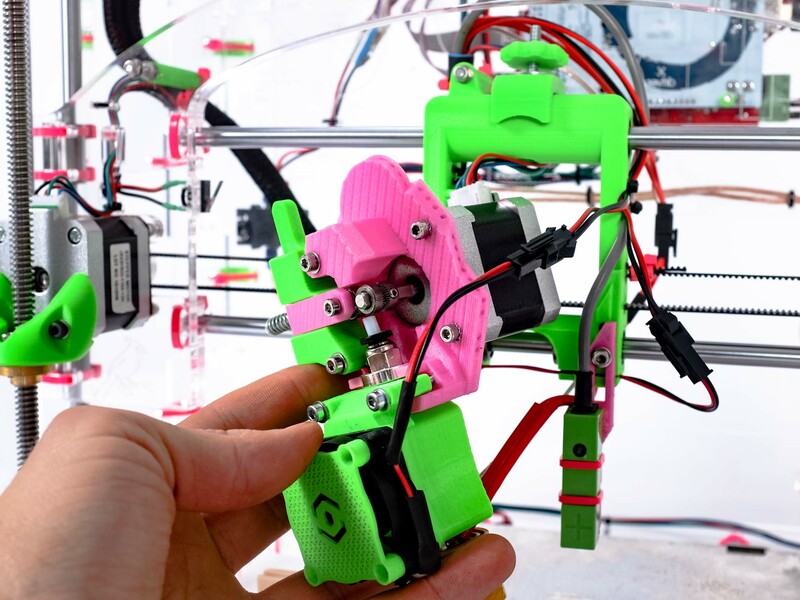 Quick release extruder, quick release build plate, quick release hotend, auto bed leveling… all the conveniences to keep you printing and experimenting with less effort. Keep some quick-release spare parts handy, and you’ll never be left hanging. Clear acrylic construction to expose the inner workings. It’s the ultimate anti-black-box. Also, did we mention we have the best wire-management in town? Moreover, we have etched the electronics scheme into the printer itself. Now every bystander has to learn something. Choose from family & schools friendly "Easy Build" and ultimate "Makers" kit. Make the ultimate anti-black box. All components should visible and explicitly functional. Nothing should feel off limits. Nothing should feel complicated. There is no magic here. Just science. Ease of build is paramount. Most companies try to make their devices easy to use. We go a step further and make the build itself of the device as effortless and educational as possible. Plus, it must be done in mere hours. Never compromise print quality. No 3D printer kit is good without being a great 3D printer as well. Focusing on ease of build must never be to the detriment of function or user experience post-assembly. 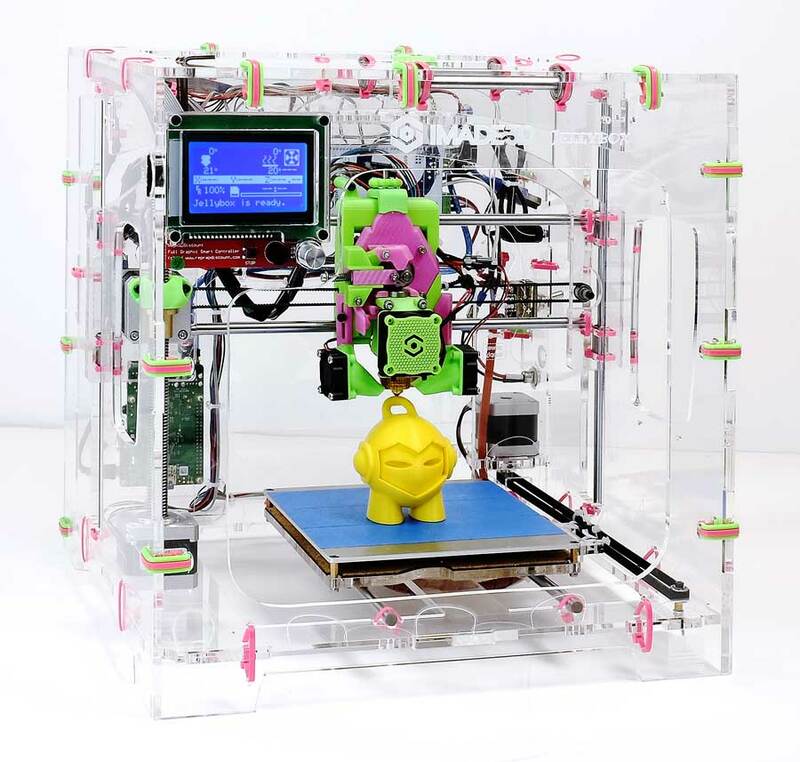 Whereas I HATED the frustrating “build experience” of my first 3D printer kit, I absolutely LOVE the uniquely innovative construction and simple build process of the JellyBox kit. It’s by no means self-evident that this crazy idea would work, but it does! Oh it works better than even we dreamed, and we are first class dreamers. 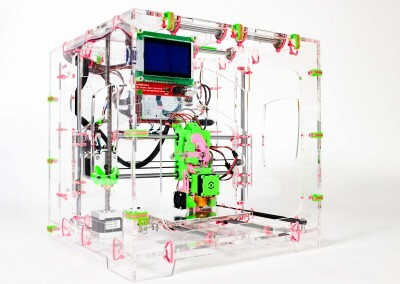 The first printer we designed (known as Pink Frog) a long time ago was all metal construction with rigid frame and steel bolts all over it. It was a workhorse for power-users, but it was not easy or fast to build. 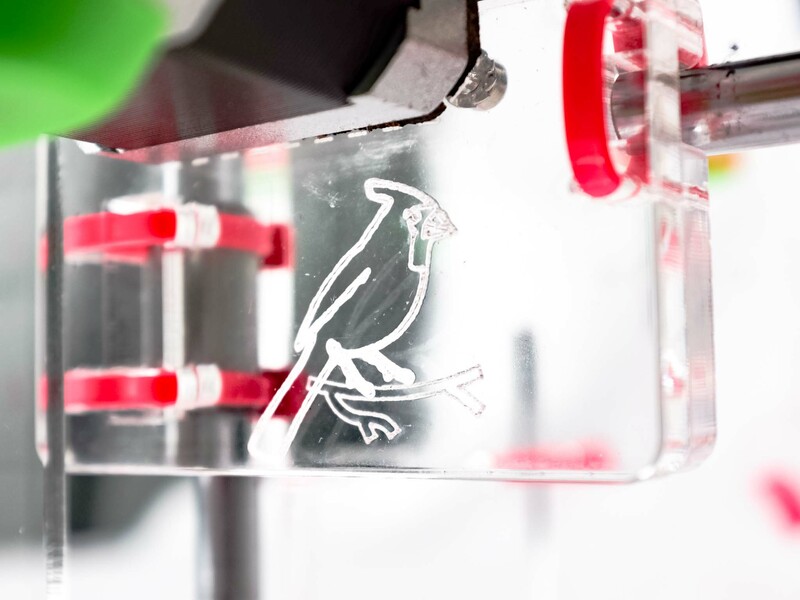 Jellybox is the opposite of obvious CNC design: we ditch the as-rigid-as-possible connections and instead allow the components to self-adjust within their manufacturing tolerances. 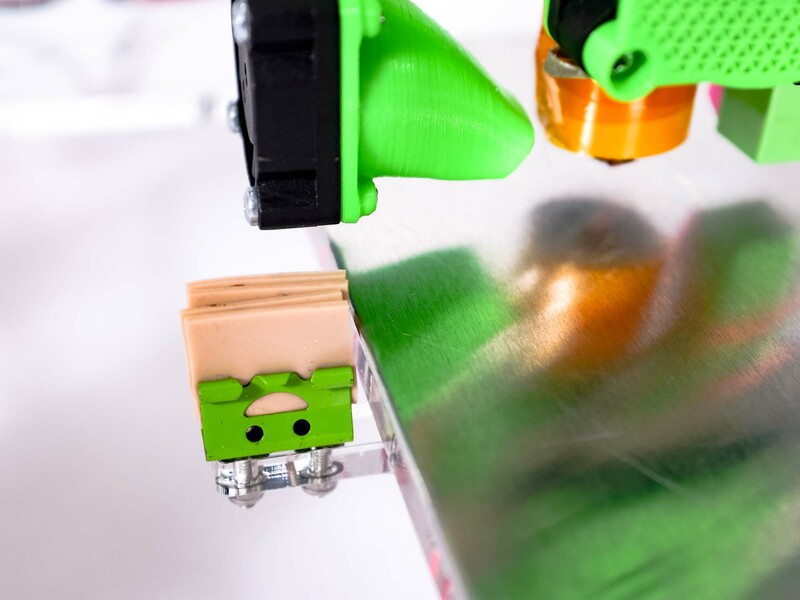 The Jellybox frame, being an interconnected cube, is plenty rigid, and the relative flexibility helps reduce vibration artifacts! Reality is people can’t believe the print quality we achieve on our Jellyboxes. 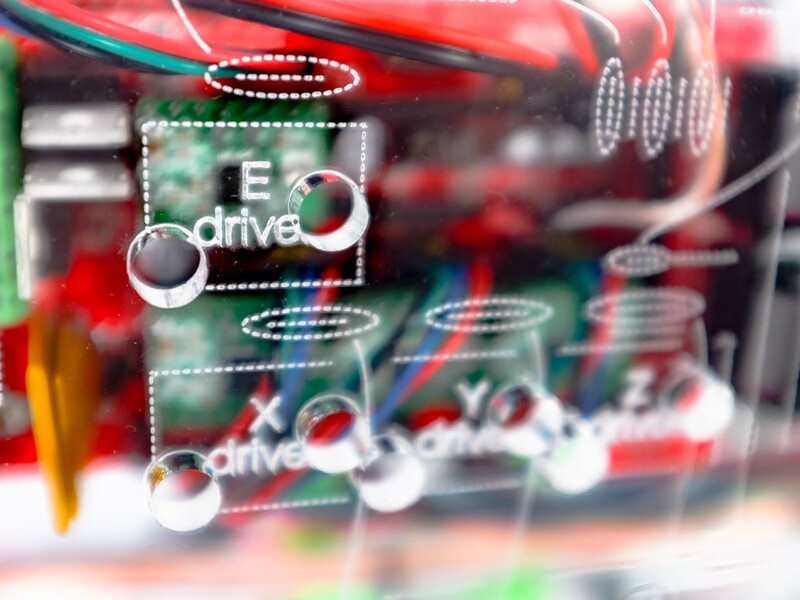 Zip ties and lasercut acrylic are incredibly fast to put together and there is virtually no margin of error. Just tighten the ties as much as you can. Done. Any mistakes are a breeze to fix now because zip ties are a breeze to undo! Just snip and pull. The slight flexibility the ties introduce allow the components to self-adjust giving you the best movement within manufacturing tolerance possible. Cheap. (Even though the ones we painstakingly chose as their quality is second to none are more expansive than your average run of the mill zip ties. Wires need space. Instead of cramming them into tiny closets as is common, we give each wire the space and attention it deserves. Not only are all wires routed clearly and mounted so that they cannot come loose or interfere with any movement, but wires that can interfere with each other’s signals are kept separate. Moreover, we have etched a symbolic wiring diagram into the printer itself. Now even onlookers have no option but to understand what’s going on there. No magic. Just science. Talk about implicit learning! Every component can be easily replaced or swapped. This makes maintenance, repair, or experimentation a true pleasure. And we mean e-v-e-r-y component from wires to assemblies. Upgradeable? Future-proof? – You bet. 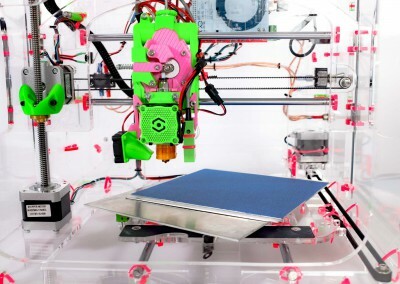 Quick-swap hotend makes printing with various nozzle sizes a no-brainer. 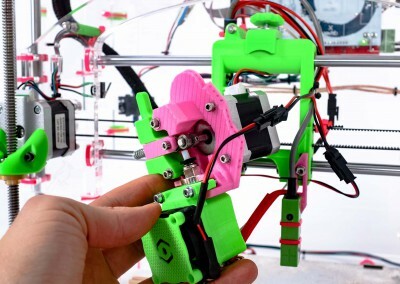 Quick-swap extruder is an even more streamlined option. This allows you to use the best extruder for the job (3mm vs 1.75mm, all metal vs. composite hotend, different melt zone configurations…) on a whim. The whole x assembly can be taken out/swapped with the snip of 4 zip ties. The whole y assembly (build plate) can be taken out/swapped with the snip of 4 zip ties. All electronics are easily accessible. Any single component be it a driver or arduino or RAMPS can be swapped in minutes. Raspberry-pi ready for wi-fi upgrades and more. We even designed an integrated power supply for you. (PCduino fits, too :-). Even any part of the actual frame can be cheaply replaced. Even though we confess that to take out parts of the acrylic box, you need to cut quite a few zip ties. We have gone through rigorous testing to select every single component on the Jellybox. No time or expense spared. For the hotend, we go with wildly popular genuine E3D hotends from UK. Nothing beats the original. (We add an upgrade to make it print faster custom made in Czech Republic.) But we don’t just blindly use the most expensive components on the market. Instead, we work directly with manufacturers and keep pushing until they deliver the quality we demand… or we find someone else. No middle man means we know exactly what we’re getting every single time. We source materials worldwide, but all the manufacturing is done at our plant in Blue Grass, Virginia, which means we have total control. 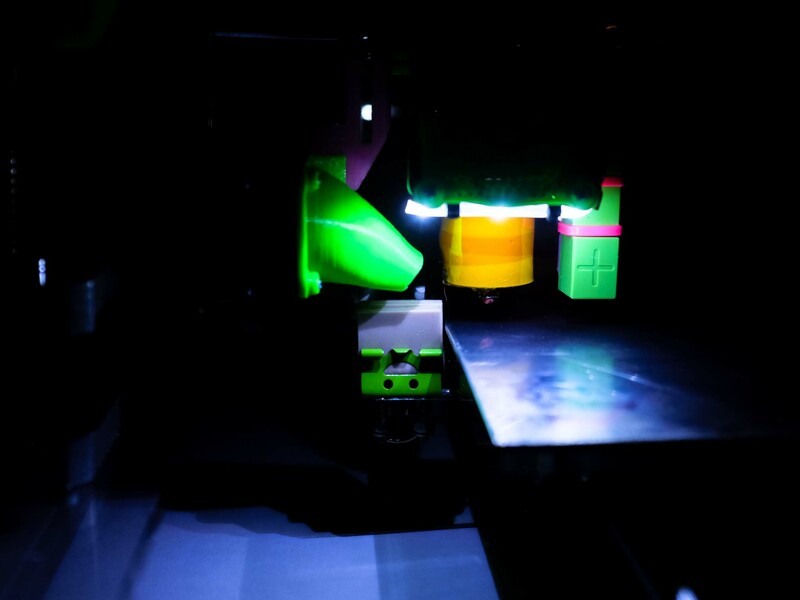 You’re not just buying a 3D printer: You’re investing in learning. Easy Build Kit is designed for easy and speedy assembly. The Makers Edition Kit is the full DIY experience. Easy Build kit arrives with parts of the JellyBOX pre-assembled to both speed up the build and make sure you everyone succeeds. We carefully chose what parts to pre-assemble so that the hands-on learning doesn’t suffer. You still get the on-of-a kind intro to 3D printing: just faster and easier. 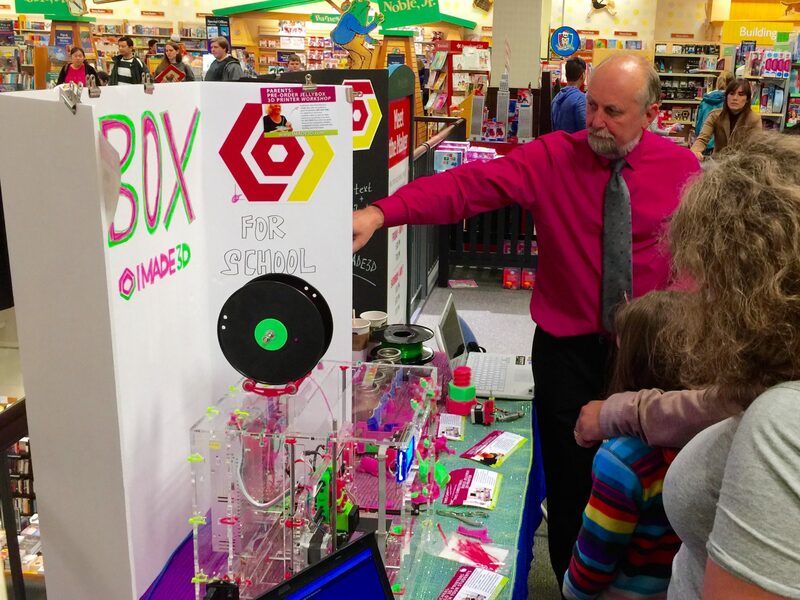 Easy Build kit is best choice for parents and kids, 3D printing beginners, in-class and after school programs, accelerated builds, to build with students in regular classes, after school program or summer camps. 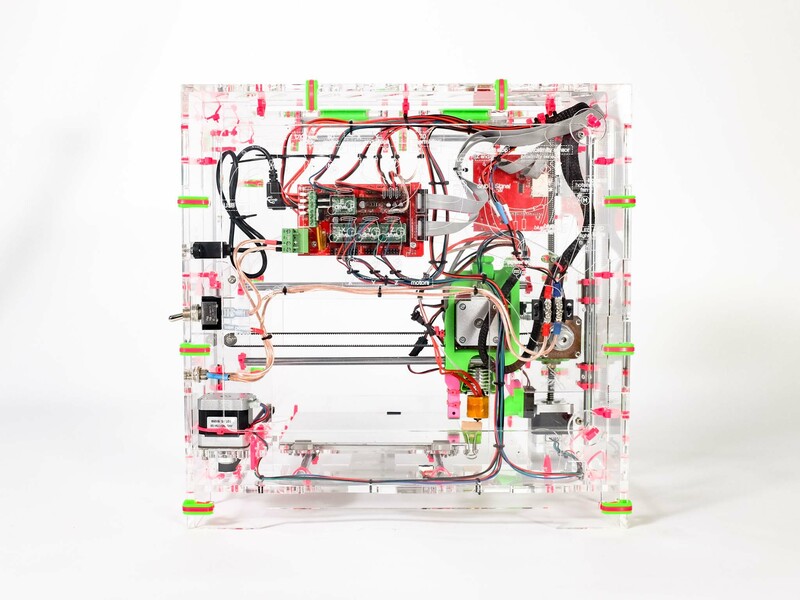 Easy Build kit is also used in our “1-Day Quick Build”, where you can build the whole JellyBOX and learn to print in a single day led by our experienced instructors. In Maker’s kit nothing comes pre-assembled. You get all the learning there is. You will build your JellyBOX “from scratch.” Still, no soldering or crimping necessary (= plug and play). All wires are cut to length, crimped & labeled. Control unit is pre-loaded with proper version of firmware (Marlin) to be ready-to-print after the build. 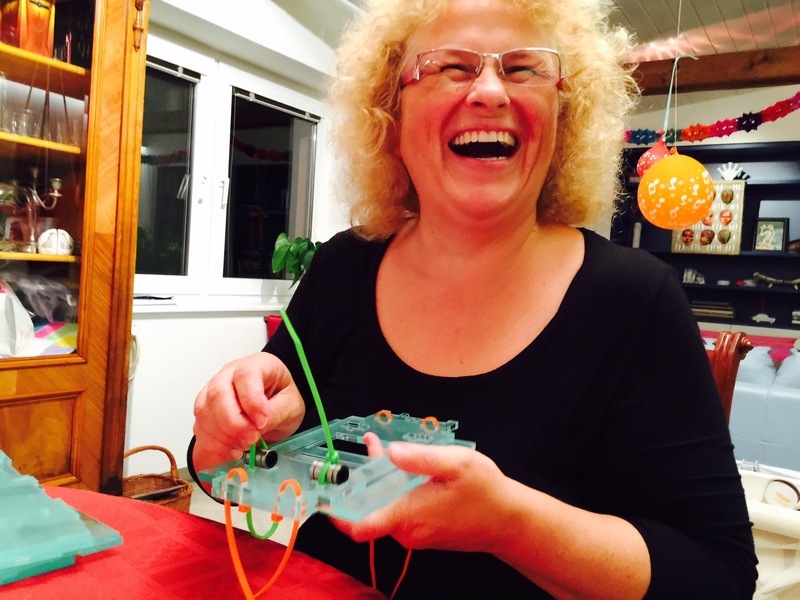 Best for enthusiastic makers with technical background. Nothing but a truly obsessive attention to detail and unwavering drive for the best and most elegant solutions will will give way to a creation that inspires a deep pride. 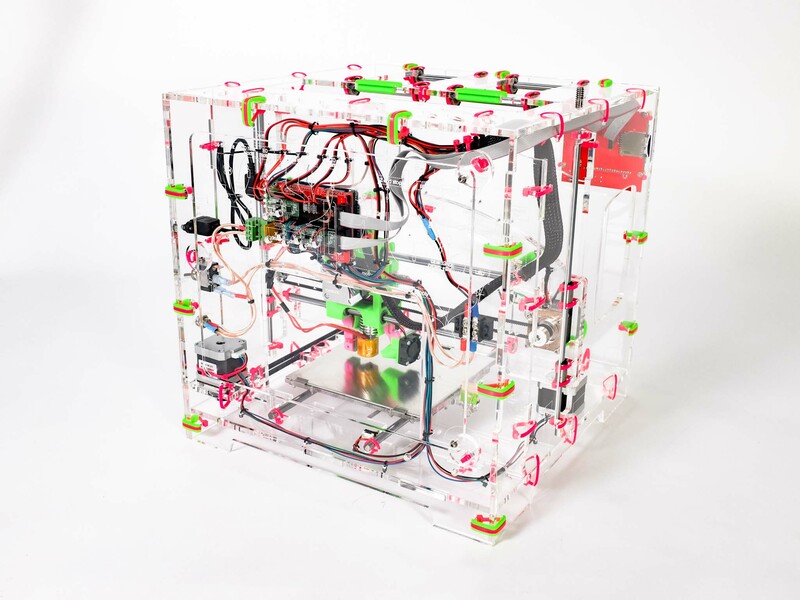 After endless iterations, Jellybox is ready to meet it’s maker: you! That is, Jellybox is a cube of 365mm (apx 14”) sides, with the x axis slightly extending on left and right at 390mm (apx 15”). Filament: tested with PLA, PETG, TPU (flexibles, ninjaflex) and many composites. ABS not recommended (see FAQ). Hotend: E3D Lite6 with 20mm meltzone (Volcano upgrade). Heated Bed: Yep yep yep. Base JellyBox comes with cold bed, but we have plug and play heated bed upgrade. Dual Filament Fans: this one is a no brainer awesomeness. Using a more specialized ‘flat’ proximity probe, you can run two cooling fans. Wifi Print: JellyBox is made to seamlessly accommodate Astroprint and Octoprint on Raspberry Pi. 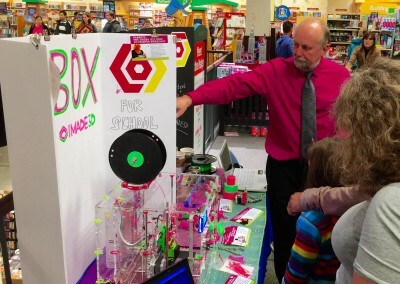 JellyBox respects your inner tinkerer. 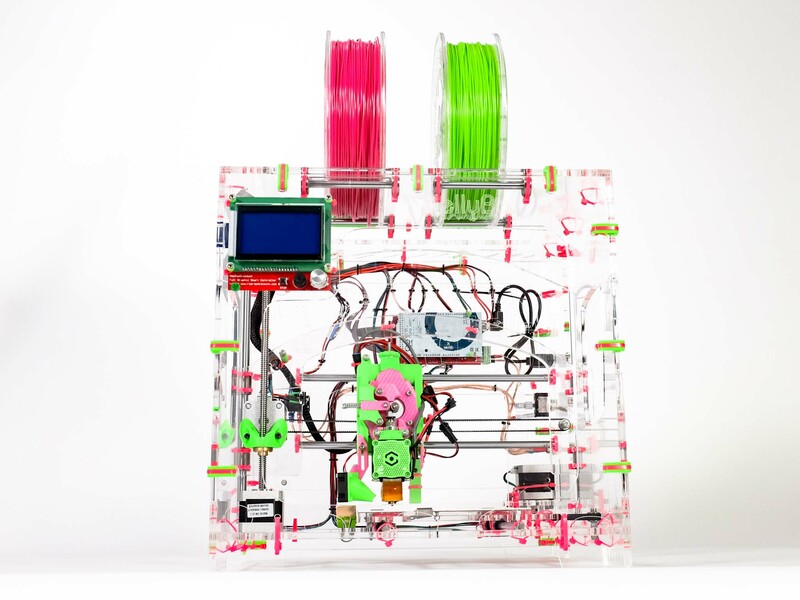 As children of RepRap, we kept most of the JellyBox parts 3D-printable so it’s easy to hack. We love remix culture and publish our design files so you can modify your printer in any way, print yourself spare parts, or even make yourself your own JellyBox from raw materials 🙂 For the files, head over to the IMADE3D github page. Will there be a heated bed upgrade? There is – you can get in in our e-shop right now! It goes up to 80ºC, which is more than enough for almost any common filament (but ABS. We don’t like ABS, and you should too). *Thanks to Jack for this question and to Chris for keeping us on track. Chris, your nagging has paid off! Ever since PETG became readily available, ABS lost all it’s appeal to me. *Thanks to Becky, Chris, Joe, Jack and countless others for this question. There’s been an explosion of filaments. One can do very easily without ABS today no matter what mechanical properties one seeks. 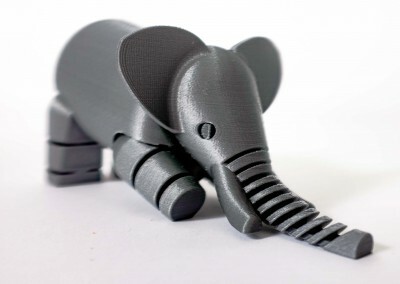 PET, PETG, PLA/PHA, Nylon blends, carbon reinforced PLA and PET… the world is an oyster. Yes! (this is a link) We deeply and sincerely LOVE REMIX culture. We believe ideas are born out of other ideas, and being able to build on other people’s projects is path to innovation. Similarly, we LOVE HACKING or, more specifically, making things do what we want the to do and modify them to suit our needs. Also, we LOVE REPAIRING our own devices. Plus, we don’t like to lock people into some sort of Orwellian proprietary system. After all, we are all children of RepRap. For all these reasons, we publish not only our production files (3D: stl and gcode, 2D: rld), but also source files that are way way easier to modify (3D: step). We want you to play with the design! Make it better! See how it’s done. CC BY-NC-SA 4.0 We do love the remix culture, however, we do this for a living, and research and development of hardware AND of the build experience is incredibly arduous, resource intensive, and plainly expensive. We are building a network of licensed trainers and licensed manufacturers (Franchisees – interested? We strike good deals. Shoot us a message. ), and we need to be able to guarantee our partners a competitive advantage at the beginning. Thus, we publish the files under Creative Commons Attribution-NonCommercial-ShareAlike (CC BY-NC-SA 4.0) license. This allows anyone to print spare part to fix their printer, remix the parts, hack the heck out of it, even build a whole new project on top. 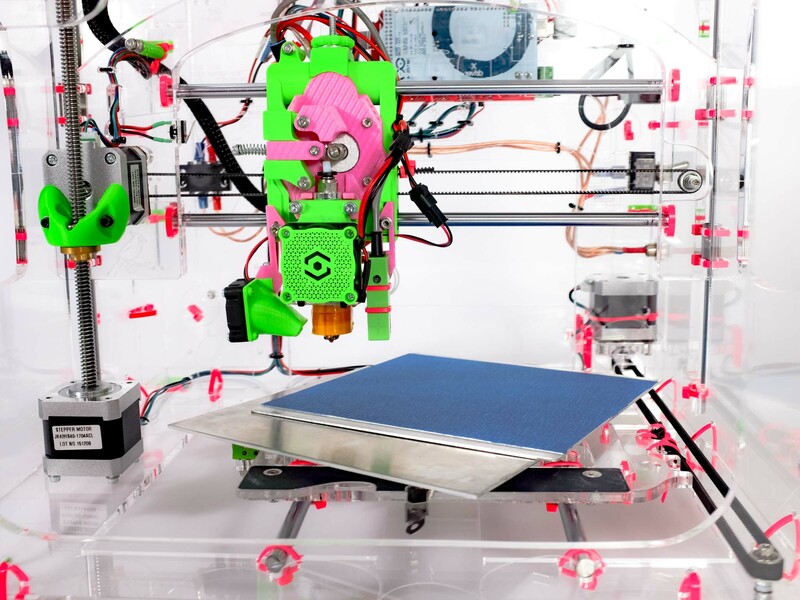 Yet, this is not strictly Open-Source as the Open Source Hardware Association would tell you, but it is a common practice, it’s within RepRap guidelines, and most people in fact do consider this open source. Even the original versions of GNU allowed non-commercial clause! If you are interested in custom commercial licensing, we are definitely open to that. Shoot us a message. How much can I print from 1kg of filament? May I see the build instructions? Where are the docs? There’s a link in the SUPPORT section of this site.